We recall how Sonny Liston, who died on this day, visited Newcastle in 1963 and rode through the city centre on a white horse. The former world heavyweight boxing champion, Sonny Liston, died a lonely death on this day in 1970. And his connection to the region? Ali’s visit to the North East in 1977 has been well-documented. Liston’s visit 14 years earlier is less well-remembered today. The fearsome hard-hitting champ, known in the US as the Big Bear, arrived in the region in September 1963 as part of a European tour. When his train pulled into Newcastle Central Station on the evening of Sunday, September 15, there was a big crowd anxious to get a glimpse of the menacing heavyweight. Next day, as our photos show, thousands turned out in the city centre to witness the extraordinary sight of the champ riding through Newcastle on a magnificent white horse. Liston, like a character from a classic western movie, cantered confidently on the horse, riding from the Royal Station Hotel to the now-demolished New St James’ Hall where he gave a boxing exhibition. In front of a packed house, Liston broke into nine minutes of rapid skipping as the James Brown single Night Train blared from the speakers. The champ then embarked on a three-round work-out with his sparring partner Foneda Cox. In addition, there was a full boxing bill headed by George Bowes, from Hesleden in Co Durham, who fought an American opponent. 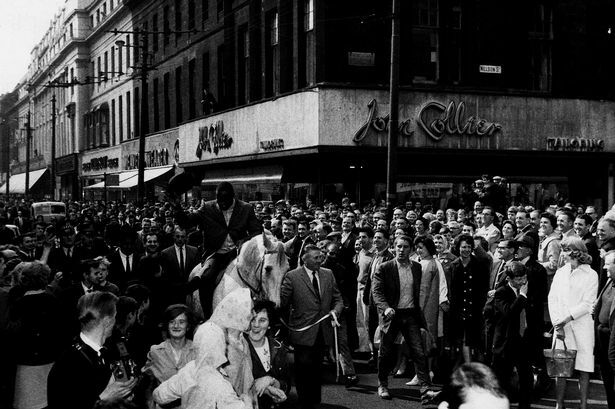 The Geordie crowds were clearly delighted to see Liston - and their respect was reciprocated. “These are good people,” he remarked to a Chronicle reporter. American crowds had never warmed to the bad-tempered Liston in the same way. He came from a tough background. He was born into a poverty-stricken farming family in Arkansas, around 1932. He was, incredibly, the 24th child of the 25 children his father had by two wives. Aged 13, he ran away to live with his mother in St Louis and it was on the mean streets of the city that he drifted into crime. He served jail terms for violent offences, and he was rumoured to have been employed as a strike breaker and as an enforcer for the Mafia. 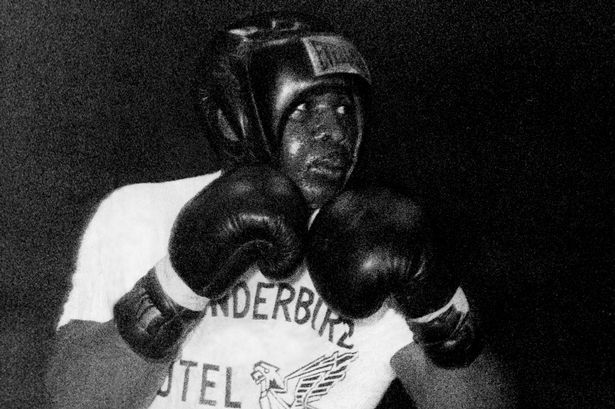 He began boxing in prison in the late-1940s and found he had a real talent for the sport. In 1963, as Liston left after his two-day visit to Newcastle, he remarked how much he had enjoyed his visit to the city. His and Ali’s paths would cross just a few months later when Liston would lose his title in controversial circumstances. Motor-mouth Ali, then just plain Cassius Clay, taunted Liston in the media in the run-up to the February, 1964 bout. Ali would also win the return fight in 1965, and it has long been rumoured Liston took a dive. For Ali, the boxing world was at his feet. For Liston, there was a slow decline. He would be found dead in his Las Vegas home, the result of a possible heroin overdose, aged 38.